By car across wildest Wales (1933). The Llanwrtydians’ farewell handshake was a sad one. Undaunted by their heart-rending appeals to desist from the venture, and with that hatred of exaggeration which is the hall mark of all journalists, discounting their accounts of the perils of the path, we turned a last look at civilisation. The pillars of Society were there to see us off, the Church in the person of the vicar blessing our escapade, and high finance represented by the bank manager, All that was so dear to us in Welsh life was symbolised by the scene on the Square in Llanwrtyd. Looking out of the car window, we saw an Italian fish and chip shop, a Baptist chapel, Barclays Bank, and the entrance to the bar of the Neuadd Arms Hotel. In bidding farewell to these, we were cutting ourselves adrift from the Wales of today. It hurt, but we were determined to cross those dread mountain fastnesses to Tregaron. We sped along rapidly, the photographer and myself in one car and a business man leading the way in a red Western Mail van. The Irfon Valley was a profusion of trees, the late-burgeoning oaks, yellow in colour, contrasting with the bright green of the beeches. On one side of the road the Irfon flowed, tumbling here and there in a miniature waterfall. Lambs, not having seen such monsters as these machines, scattered anxiously. Chickens dashed out of the way in a panic. Dark, dignified larches were silhouetted against the fresh green of the May fields. We rushed past a farmer on a grey horse, riding to his isolated farm on the hill. We were getting nearer to the Wales of yesterday. Abergwesyn Church stood out sturdy and stolid. “Now the track begins,” we reflected, as we turned to the left beyond the church and almost crashed into a gate. I opened the gate to let the cars in, and on we went on a narrow path covered with stones, each of which seemed to be waiting with the one passion of breaking the springs of intruders’ cars. Between the bumps we could look down at the valley below, see oaks and mountain ash scattered here and there, and admire the thin broken white line of a waterfall. The profusion of trees had disappeared and most of the hills around were bare, except for clumps of hawthorn. The further we advanced, slowly and gropingly, the more rugged became the scenery and the blacker became the rocks. The path was so narrow that a big touring car might easily have been caught in a wedge between two rocks, or in another spot might have slipped to its destruction into the valley below. So far the only living beings had been the sturdy mountain sheep and their lambs. But soon, feeling like an Arab in the desert, who sees camels in the distance, we saw below, near the river, three people digging. We left the cars and ran down, followed by three or four friendly sheepdogs, until we came to a man, his wife, and a girl preparing peat. And Mr. and Mrs. Jones, Llanerch-yrfa, certainly knew how to cut the peat quickly and cleanly. “Bore da,” they said, and we were greeted with Welsh warmness. They had dug a deep ditch, and as Mr. Jones cut each block of brown peat, Mrs. Jones or Miss Jones placed it by the side of the ditch. “Where is the path?” Indeed, it had disappeared. There were, it is true, a few marks of horses’ hoofs through some small dry reeds, which led into another stream. So we decided to follow those, plunge through the river, and climb the hill again, where the road became dear. “It’s lucky there are pebbles in these streams,” said the photographer, as the wheels were baptised for the third time; “If it were earth we’d get stuck.” Then came a hill-climbing test. On the driver’s face there was a look of grim determination as he climbed up the gradient, and as each bend threatened to send us skidding. 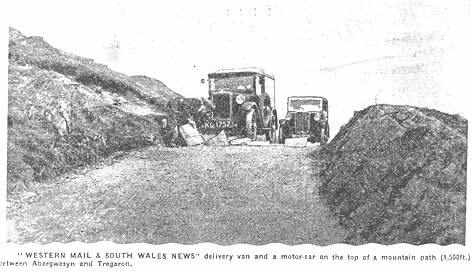 No one should attempt to go up that hill or the other hills on the Abergwesyn­-Tregaron road unless he has good nerves and driving ability. “I’ve never seen anything like it in my life,” said the man of business when we reached the top and looked down and the drivers panted. I nearly offered some hay in reward to the car, but met with a blank look from the bonnet. The view, however, was worth the nerve-strain. Behind the rugged lonely hills peeped a hazy blue range of mountains. We were ourselves about 1,500 feet high and in solitude. Before long the path took us into a farmyard, and a farmer’s dark son, a good Cardi type, with humorous brown eyes, told us in Welsh that we had gone the wrong way. “Pa le yw hwn?” I asked. “Dyma Gwm Tywi,” he replied. We had reached the top of the Towy Valley, but here the ruggedness of the scenery was a contrast to the luscious greenness of the Towy near Llandllo. The two or three farms in this part of the Towy Valley were spotlessly clean and almost dazzling with their newly white-washed walls. For miles we then drove on across what is perhaps the loneliest stretch of bare heath in Wales. We greeted one farmer who was leading his horse and had several dogs racing around him. There were again glimpses of blue mountains in the distance and a white patch of lake when we passed Llyn Berwyn. Before long we were descending beneath a dark, overhanging cliff into the plain again, trees re-appeared, and children darted out from cottages. The perilous journey was over, but no crowds were gathered to meet the two drivers who had fearlessly conquered the Abergwesyn-Tregaron route. No reporters swarmed around us; the Tregaron Post Office did not send a single cable across the Atlantic to announce our triumph. But, hyperbole apart, the Abergwesyn-Tregaron is a tough venture for any driver, even in fine weather, as we had. In mist it is more than a venture: it is a form of suicide. But it is worth venturing, for he who crosses the mountains there can not only see some of the finest views in Great Britain, but can boast if he reaches the other side of being both a good driver and a brave man.